Recently there was a scientific report proving the mobility action of enzymes during a catalysis reaction. Considering this statement as a clue, scientists from Pennsylvania State University made natural enzymes to move with the help of a pumping motion for developing nanobot pumps. 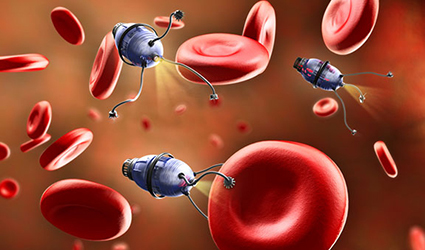 As part of the treatment, the scientists used these nanobots to destroy harmful nerve agents. These destructive nerve agents are organophosphates, which lead to permanent neurological damage. Organophosphates can be deactivated with the help of an enzyme named organophosphorus acid anhydrolase. At first, this enzyme should be immobilized on a therapeutic drug. Then this drug should be embedded into a nanobot pump, which acts upon organophosphates and deactivates it. These research findings will be presented at the 256th National Meeting & Exposition of the American Chemical Society (ACS). After looking at the success of this research, the scientists are planning to use these nanobot pumps for protecting the clothes of military personals. The enzymatic nanobots can also be used for enzyme-powered drug-delivery system and insulin-pumping devices for diabetes.